Excluded Ancestors focuses on little-known scholars who contributed significantly to the anthropological work of their time, but whose work has since been marginalized due to categorical boundaries of race, class, gender, citizenship, institutional and disciplinary affiliation, and English-language proficiency. 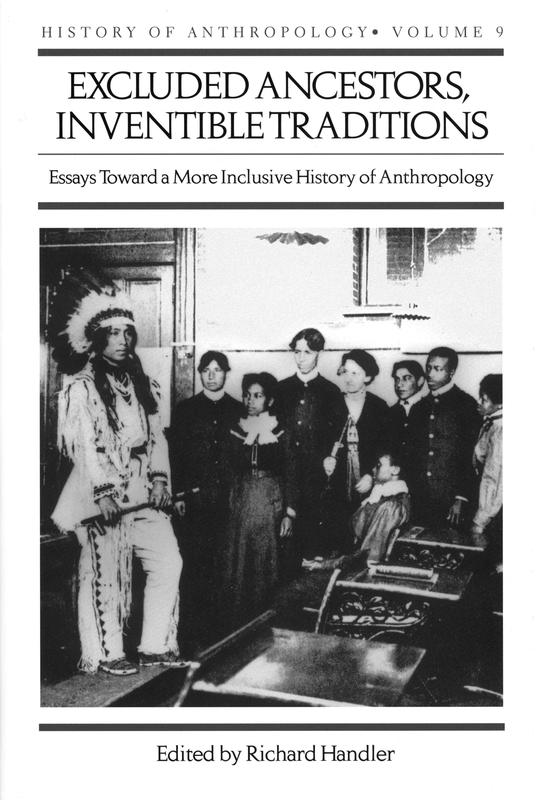 The essays in Excluded Ancestors illustrate varied processes of inclusion and exclusion in the history of anthropology, examining the careers of John William Jackson, the members of the Hampton Folk-Lore Society, Charlotte Gower Chapman, Lucie Varga, Marius Barbeau, and Sol Tax. A final essay analyzes notions of the canon and considers the place of a classic ethnographic area, highland New Guinea, in anthropological canon-formation. Contributors include Peter Pels, Lee Baker, Frances Slaney, Maria Lepowsky, George Stocking, Ronald Stade, and Douglas Dalton. Richard Handler is a professor of anthropology and director of the Global Development Studies Program at the University of Virginia. His many books include Critics Against Culture: Anthropological Observers of Mass Society and HOA Volume 11, Central Sites, Peripheral Visions: Cultural and Institutional Crossings in the History of Anthropology, both published by the University of Wisconsin Press.